Researchers from the Joint Quantum Institute stimulated quantum dots to improve on the entanglement needed for quantum key distribution. Classified government files, credit card information, and other sensitive data are often protected by sophisticated encryption. These typically use public key cryptography, a system developed in 1977 and still in use to date. However, quantum computers threaten the security of the conventional system. Tobias Huber and other researchers have collaborated to improve methods of quantum key distribution. Current computers, even the most powerful, take an extremely long time to decipher the keys of a computer using a public key cryptography system like RSA (Ron-Shamir-Adleman). Quantum computers, however, can quickly decrypt these keys. Quantum key distribution would ensure two parties could transfer data safely no matter who tries to interrupt. Quantum key distribution relies on a pair of entangled photons that share a quantum connection. The method allows the distribution of an encryption key between two remote parties while ensuring the security of the transmission cannot be compromised without an immediate red flag. Tobias Huber, a recent Joint Quantum Institute (JQI) Experimental Postdoctoral Fellow, has focused much of his work on finding the best environments for the photon entanglements that would make quantum key distribution practical. While attending the University of Innsbruck in Austria, he collaborated with his supervisor, Gregor Weihs, and Glenn Solomon, a JQI Fellow, to study quantum dots as a source of entangled photons. Quantum dots exist in a nanometer wide space within a semiconductor which is inside another semiconductor. This tiny space behaves like an artificial atom does when stimulated by photons of the appropriate color. That is, the electrons inside the quantum dot can change energy levels, leaving behind holes that are filled by a released photon when the electron eventually decays. While the electron is excited and the hole still exists it is called an exciton. When paired with another electron and hole, a biexciton is formed which decays emitting two photons. Using sequences of laser pulses, the team of Huber, Weighs and Solomon created biexcitons in quantum dots. The team encoded information onto the two ejected photons, which formed a relationship they called a time-bin entanglement. 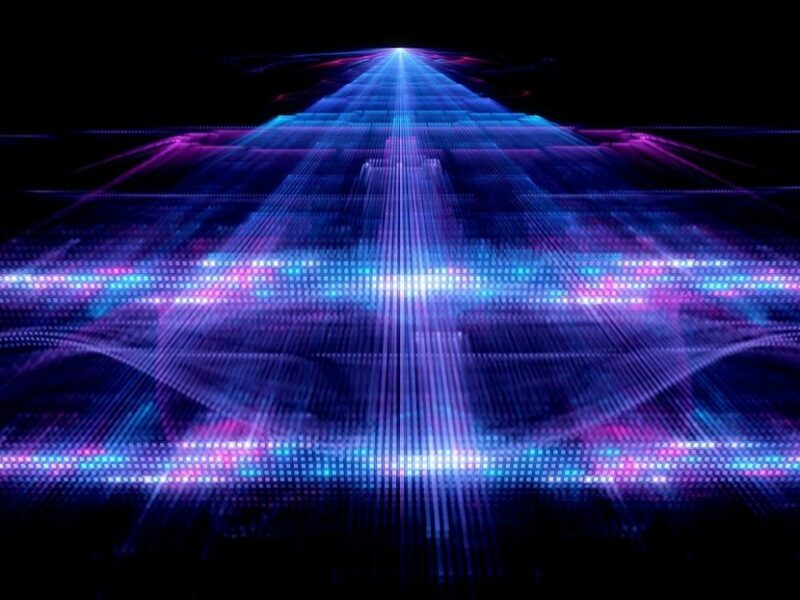 This improved entanglement is now the most reliable for transmitting quantum information through optical fibers without the risk of photon degradation over long distances. Unlike parametric down-conversion, a competitor method of quantum entanglement, quantum key distribution using a time-bin entanglement is virtually impossible to disrupt without being immediately discovered. If this development can be made practical, our data could be impenetrable to digital thieves using quantum computers.